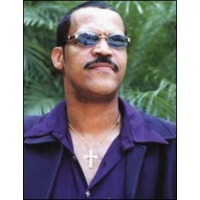 A Dominican Republic-born singer transplanted to New York City, salsa star Raulín Rosendo was born in Santo Domingo on August 30, 1957. Steeped in the rhythms of Afro-Antilles music throughout his childhood, he began his performing career at the age of 12 as a member of the merengue group El Chivo y Su Banda, later appearing with acts including Fernando Villalona, Conjunto Clásico and Los Vecinos. Known as “The Angry Sonero”, Rosendo made his solo debut with 1990's Salsa, Solamente Salsa; by 1993 he was recording in New York with producer Ricky Gonzalez, scoring the hits Amor en Secreto & Santo Domingo. The subsequent success of albums including ¡Lo Maximo!, 1995's Dominicano Para El Mundo, 1997's ¡Contrólate! & 1998's Llego la Ley established him among the biggest salsa performers of the period. Donde Me Coja la Noche followed in 1999.